Neil McRoberts wants Portsmouth to be far more clinical in their London three south west contest at Trojans on Saturday (3pm). The new head coach at Rugby Camp was pleased to make a 14-8 winning start against Petersfield in their opening league game. He felt his side made hard work of it, though, and wasn’t happy with the performance. The team need to step it up against Trojans and make sure they are ruthless with their opportunities. He said: ‘It is always nice to start with a win but I felt we could have played much better. ‘Our finishing wasn't clinical enough. ‘A number of scoring opportunities eluded us and made the game tighter than we liked. Louis Bristow will make his first start in the second row after switching from Gosport & Fareham. He went on as a second-half replacement in the first game and did well. In the three-quarters the visitors are boosted by the return of Simon Morgan at scrum-half. On the wing Fijian Sully Caucau replaces the injured Luke Simmons. It is a big weekend of rugby for Petersfield at Penns Place. On Saturday they entertain United Services Portsmouth in London three south west (3pm). The home side took a lot of encouragement from their performance in their opener at Portsmouth. Services also started their campaign with a defeat, losing a high-scoring game against Winchester. Captain Rich Neil is expecting another tough encounter. He added: ‘We were happy to take two losing bonus points from our first game. On Sunday the club are hosting an RFU Inner Warrior Camp designed to attract more women into rugby, through playing, coaching or refereeing (1pm to 3pm). Participants will be shown key introductory skills and drills for rugby. 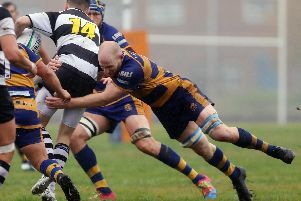 Southsea Nomads host Petersfield II in Hampshire two.